However popular multi-tenancy has become in cloud computing, this concept still sounds a bit like a mystery. 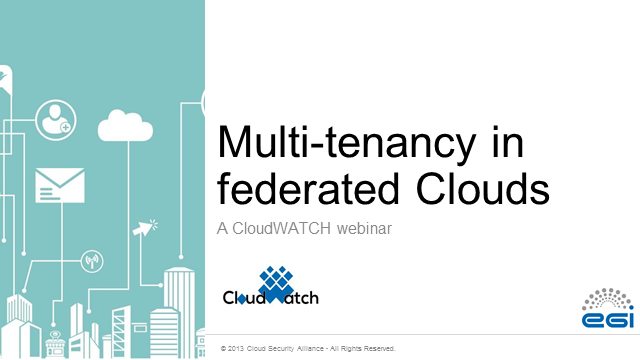 This CloudWATCH webinar will provide you with a chance to get a crystal-clear take of the concept by clarifying how tenancy is defined, how relations between tenants and their behaviour should be designed. Indeed, in a typical multi-tenancy environment, multiple users who do not even see each other’s data can share the same applications run on the same operating system, using the same hardware and the same data storage centre. We will also cover issues related to tenant identification, federation models and data access and probe advantages and possible downside of running multi-tenancy systems: cost savings, consistency, safety, etc. On 28 August you will have the opportunity to ask questions in this interactive webinar.